In episode 28 of Just Shoot It, hosts Matt Enlow and Oren Kaplan talk with Gino Roy, a director who’s just wrapped his first big digital series. He talks about how multiple skills and interests coalesced into directing. 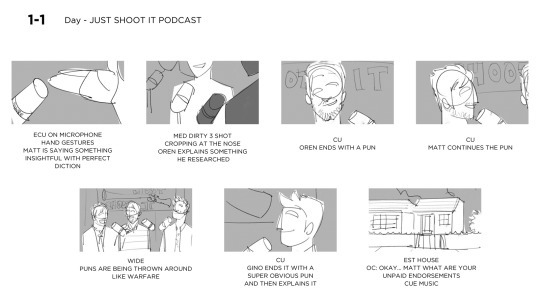 In preparation for this episode Gino storyboarded what he thought the experience would be like. It’s a great glimpse into his prep process, and actually a pretty accurate depiction of what it’s like to tape our show. Oren: read Ed Catmull’s take on Pixar’s secret creative sauce: Creativity Inc. and Pixar’s storytelling secrets. and Gino: Shooting your life, and using hazel to organize your footage (and then editing it into dope videos like the one below).